The first two days of this week have gone by slowly, and it seems like everyone I know is on vacation or about to be, so today really called for some pretzels. I first had these when my parents were breaking in their new KitchenAid mixer, and was shocked that there was no butter in the recipe at all. These pretzels are amazing, tasting just like those really greasy ones from the mall, and so easy to make. I hardly ever cook on weekdays, so for me to put together something that needs to rise was a bit of a miracle, and also a testament to how simple they are. They hardly take any effort at all, especially if you have a stand-up mixer, and the pretzels turn out absolutely perfect every time. Although I can't say if they'll make the rest of my week move any faster, they definitely helped improve my mood this evening, and for this Gratituesday, that's enough. I serve these with honey mustard, which is extremely simple: mix together 1/2 a cup of mayonnaise with a 1/4 cup honey and 2 tablespoons of dijon mustard. It makes a ton and it's seriously the best dip ever. Even though they taste best fresh, I've brought cooled pretzels and this dip to parties before and it's been a big hit! oh no...this looks way too doable for me to resist! These would be perfect for a snack for The Masters this weekend (guilty golf fan)! I love you "gratituesday" title - so cute! 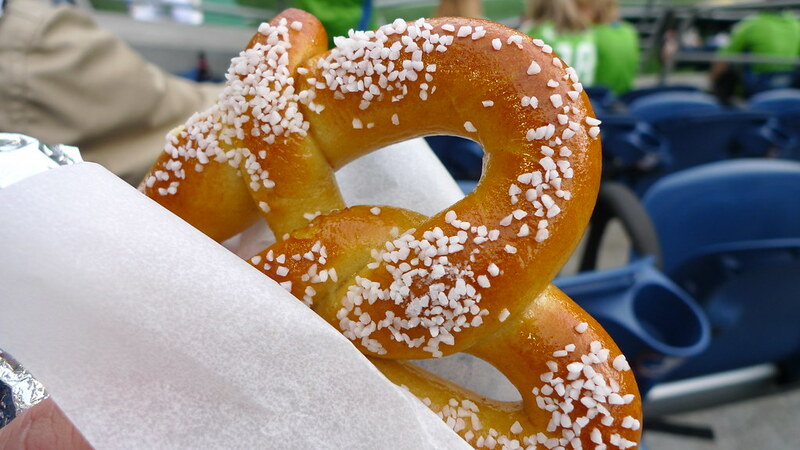 Soft pretzels are one of my favorite things.